I have to confess, the reason I started reading Shadow Train was because the plot promised martial arts and we all know I’m a sucker for martial arts literature. And yes, the rest of the plot intrigued me. The combination of Shen magic, martial arts, and steampunk-ery, was irresistible. I had to read this book. But in all my excitement, what I failed to notice was that this is book 3 in the YA series The Tracks. Of course this means I’d somehow missed books 1 and 2, and I’m still not sure how that was even possible. Anyway, my excitement bubbled over and I plunged into reading. From the first few sentences I was smitten, eager to know more but after the 5th or 6th name mentioned before the end of chapter 1, confusion crept in and I knew it was because of all the characters I’d been bombarded with. So I cheated. I backtracked and read the first few pages of Dark Territory, the first book, just so I could center myself and get the characters straight in my head then I returned to Shadow Train. 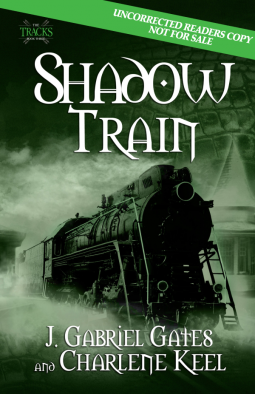 Shadow Train’s tale revolves around five Flatliner friends who must find a way to reunite a broken but powerful ring filled with Shen magic in the hopes of finding their long lost friend and leader Raphael Kain. As if being hunted by the Toppers and rich brat Rick Banfield wasn’t enough, what’s left of the Flatliner’s meager, broken world is being taken over by secret government agencies, mysterious Chinese Kung Fu masters, and vengeful fallen angels all wanting to get their hands on the magic ring. But the five Flatliners must fight against all odds to find Raphael and calm the rising tide of war before their world disappears forever. By the time I reached chapter 5, I knew enough about all the characters and what they wanted to get through this fast paced, action packed story. I think what stopped my imagination from opening up fully and engaging with the story on a deeper level was that there wasn’t enough descriptive information to ground me in the story’s world. But I chalked this up to the fact that I hadn’t had the pleasure of reading the first two books in the series before tackling book 3. Nevertheless, I kept reading. I wasn’t going to let this minute detail stop me now. The story heats up when Topper baddie Rick Banfield beats Flatliner Emory to a bloody pulp on Valentine’s Day. When Bran, a fellow Topper, arrives on the scene and tries to call the paramedics, Rick threatens to destroy Bran’s family and brand him as an accessory to the crime if he doesn’t keep his mouth shut and help Rick lie to the authorities. This knowledge does not sit well with Bran whose righteous internal monologue threatens to derail him. Then Zhai, the one time leader of the Toppers, and his sifu, Master Chen realizes that if they could get the broken shards of the magic ring from everyone and put it back together there is a chance it might have enough magic to bring Raphael back from the alternate world he is stuck in. But nothing is ever that easy. It will take the Flatliners and Toppers working together to make this happen, as only a few persons in each group have a broken shard from the magic ring. As if the boys didn’t have enough to deal with, the girls Dalton and Maggie must somehow mend their differences in order to pry their friend Aimee from the magnetic trance of Orias, a Nephilim, who only sees her as a means to an end. But Orias is one crafty bad guy who has managed to imprison Oberon. But when Oberon’s son finds out, all hell will indeed break loose as he will stop at nothing to make Orias beg for mercy. As the different subplots play out separately then converge, one thing is for certain, at all costs a catastrophic, magical blowout must be prevented. I thoroughly enjoyed this eventful, action packed ride and look forward to reading books 1 and 2. This entry was posted in Books, new release and tagged action adventure, magic, MARTIAL ARTS, YA fantasy. Bookmark the permalink.